Warning: Deliciousness ahead! 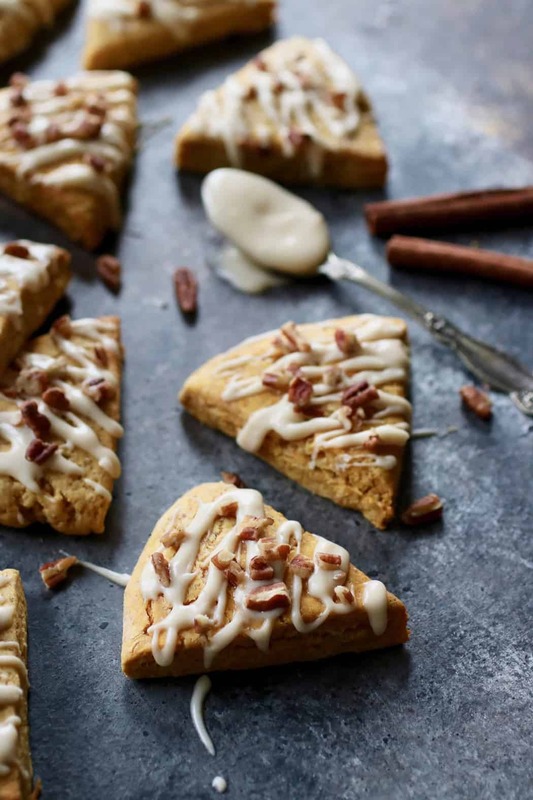 Gluten-free Pumpkin Spice Scones served along side of a cup of jo will have you extra joyful this Holiday season…or really anytime of the year. 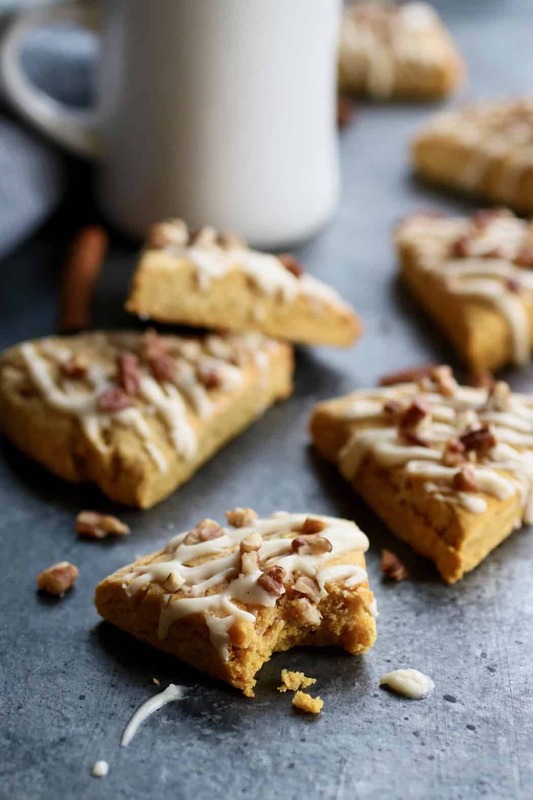 What better way to celebrate this Holiday season than with Gluten-free Pumpkin Spice Scones! We’re pretty much busting at the seams to share these oh so perfect sweet little mini-scones with you. PS: WE LOVE SCONES! They will make for the most delicious addition to your Holiday breakfast or brunch menu and family and guest will think they’re straight from the local coffee shop or bakery. They won’t even notice that they have less sugar than a typical scone. That’s right, you heard us. You see, we’re pretty ‘normal’ too when it comes to food and life. We aren’t 100% perfect all of the time. We eat sugar but not too much. And when we do, we enjoy it and chalk it up as a treat – not an everyday food. Sometimes with baking, you just have to use real sugar (we choose organic cane sugar). So why not honey or maple syrup in this recipe? Honey and maple syrup, two refined-sugar free options, are great but they are liquid base and when we tested them they just didn’t produce the best texture. While we haven’t tested coconut sugar, if you wish, you can certainly give that a try. Additionally, gluten-free flour is already tricky to work with and can get gummy so by using organic granulated sugar we were able to add a little sweetness with out additional liquid and still keep the tender, fluffy texture you’d expect in a scone. About the flour we used: Our go-to is Bob’s Red Mill 1:1 Gluten-free Baking Flour for gluten-free baked good recipes. The flour produces excellent results and no gritty texture (as you sometimes get with gluten-free flour). Another perk is that it’s widely available in stores and online and like we said, consistently produced the best results. Jess can personally vouch for this after having baked over 100 scones at a past catering job and Stacie just served these scones the other night to a group of friends who had absolutely no idea they were gluten-free! We used several Organic Valley product in these Gluten-free Pumpkin Spice Scones. Including cultured butter, plain Grassmilk yogurt, Grassmilk half & half as well as Organic Valley eggs. Organic Valley is our go-to when it comes to dairy. We both enjoy organic dairy almost daily in some form and it’s a non-negotiable for us that the dairy we consume is organic and even better, 100% grass-fed. 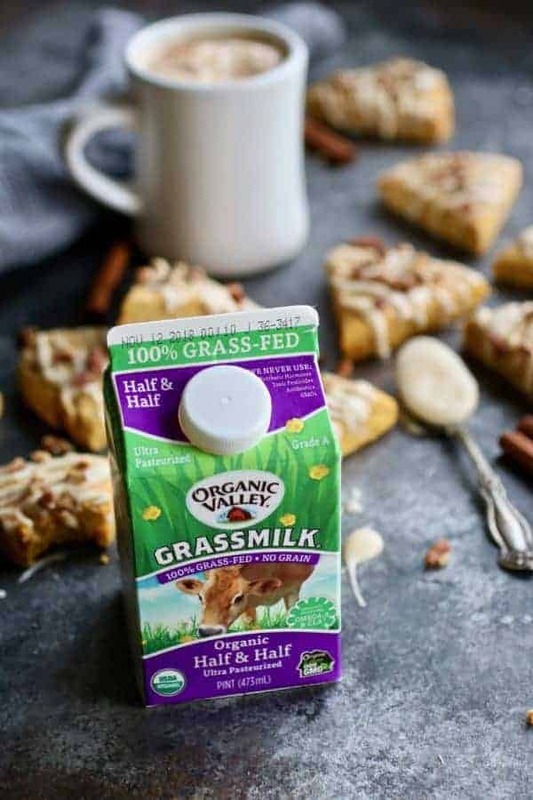 You can learn more about the Organic Valley Grassmilk products in this post and why grass-fed dairy is the best option. So there you have it. 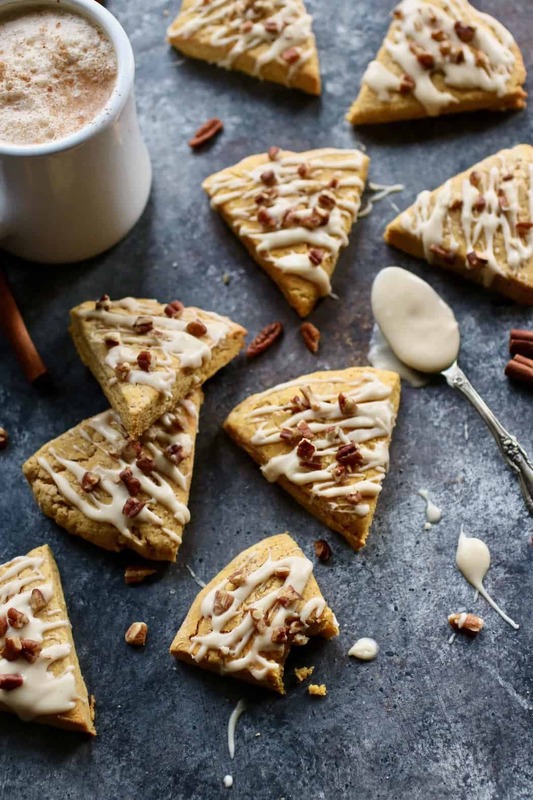 The perfect Gluten-free Pumpkin Spice Scones that you’re going to enjoy the heck out of! They’re very freezer-friendly so you might want to double the batch to have on hand for an easy weekend splurge or when unexpected company comes calling at your door. The icing is totally optional and how much you add it also up to you. Make them egg-free and/or nut-free. If eggs aren’t your friend, like in Jess’s case who has an anaphylactic egg-allergy, you can sub an egg replacer or a flax egg (1 T. flax meal + 3 T. water and let set for 10 minutes). When recipes call for only one eggs, almost always an egg-free substitution can be made. For nut-free, simply omit the pecans. We hope this recipe makes a great addition to your Holiday breakfast or brunch and we’d love to hear if you give it a try! 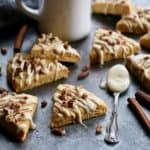 A gluten-free scone featuring the flavors of fall that’s light and fluffy and just sweet enough to hit the spot – perfect for nibbling with coffee or tea. Freezer-friendly with nut-free option. In a medium bowl, combine flour, sugar, baking powder, salt and pumpkin pie spice. Whisk to combine. Using two knives or a pastry cutter, cut cold butter into flour mixture until it resembles coarse sand. In a small bowl, combine pumpkin puree, egg, vanilla and yogurt. Whisk to combine. Add pumpkin mixture to dry flour mixture and stir with a large spoon until dough comes together in a soft, smooth ball. Using lightly floured hands, divide dough into 2 pieces, shaping each into a ball using a very light touch. Place dough a lightly floured surface and using your hands, gently flatten the balls into 2 disks, about ¾-inch thick. Cut each disk into 6 wedges with a knife or bench scraper. Transfer wedges to parchment-lined baking sheet spacing them out so they have room on all sides to expand slightly (this also prevents them from being doughy inside). Bake for 8-10 minutes or until bottoms are lightly browned and tops appear slightly dry and cracked. Remove from oven, transfer scones to a wire rack to cool before icing. To make icing, whisk powdered sugar, milk, vanilla and pumpkin pie spice together in a small bowl until smooth. Drizzle over cooled or slightly warm scones and sprinkle with pecans (if using) before serving. Store leftover scones in an airtight container on the counter for up to 2 days or freeze for longer storage. Previous articleMedical News Today: Osteoporosis: Could probiotics protect bone health?